Mon., Oct. 17, 2016, 7:09 a.m.
A GRIP ON SPORTS • So make a list all the things that went wrong for the Seahawks on Sunday, starting with Richard Sherman’s sideline meltdown. It will end up being a pretty long list. Then make a list of all the things that went right. If you want, you can stop after this: They won. Read on. • The Hawks were pretty dominating in the first half. Pretty sad in the third quarter. And able to find a way to win in the fourth. That’s the short version. The long version? You want it, or should I just skip to the end, a 26-24 decision over an Atlanta Falcon group that feels, rightfully, they were jobbed a bit. 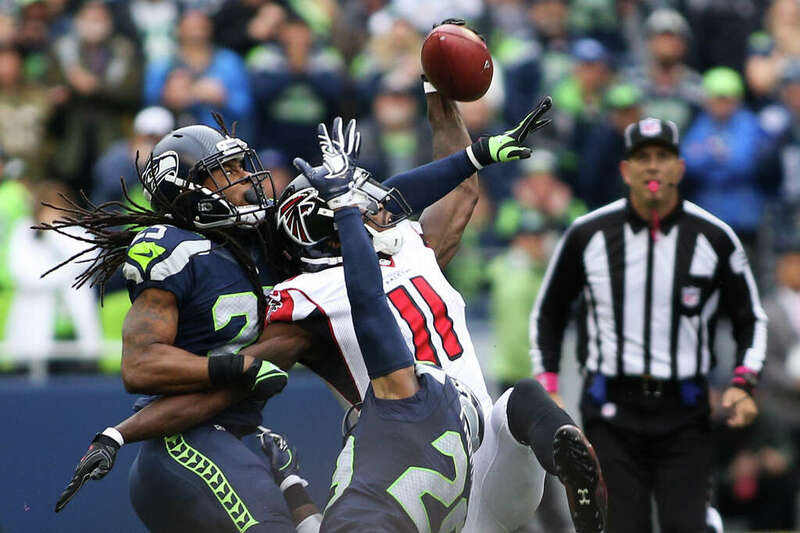 Of course, Atlanta could have played better in the opening half and not fallen behind 17-3. The offense, so formidable in the Falcons’ first five games, looked ordinary at best before halftime. Sherman helped in that regard, as he lost his cool following a breakdown in a defensive secondary playing without Kam Chancellor. And that seemed to discombobulate the Hawks more than it helped. Before you could get another plate-full of wings, the Hawks trailed 24-17 and things were looking bleak. Especially if you were counting on Steven Hauschka to pull their arguing butts out of the fire. He missed a chip shot field goal that would have cut into the lead. And then, when Russell Wilson had said enough and led the offense down the field for a score, the group of front leaked enough that Hauschka’s extra point attempt was blocked. A 24-23 loss seemed likely. Except Atlanta’s offense is built on throwing the ball. And the Falcons weren’t about to put the game in the hands of their defense. Not on the road. Not against Wilson. So they tried to put together a long drive. And that meant throwing the ball to Julio Jones. And near Sherman. That combination each touched a Matt Ryan pass that ended up in Earl Thomas’ hands and gave the Hawks hope. And Hauschka delivered this time, converting a 44-yard field goal with about two minutes left. Which brings us to the theft: A fourth-down pass to Jones, which may have been completed if not for Sherman’s early contact. It was pass interference. It wasn’t called. The Hawks win. And they are 4-1, two games up in the loss column on the rest of the NFC West. They are in the running for best record in the NFC, though Minnesota seems awfully tough right now. But there is a long way to go for everyone, with Seattle’s next game a Sunday night affair in Phoenix against a Cardinal team that basically has to win. That’s for tomorrow. For yesterday, and today, there are a couple injuries to worry about – and an outburst to parse, dissect and wonder if it will cause some permanent schism. 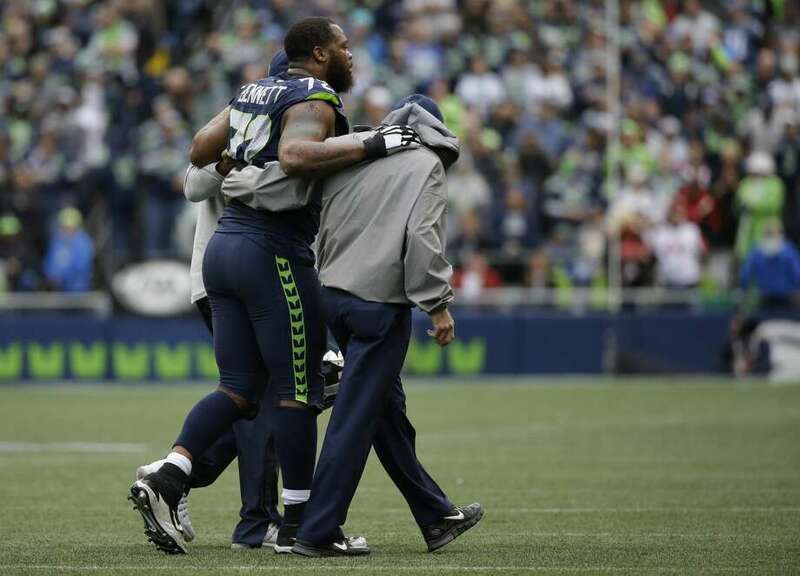 The injuries, to Michael Bennett and Luke Willson, are easily diagnosable. They will either be severe or minor. An emotional blow is a bit harder to delineate. 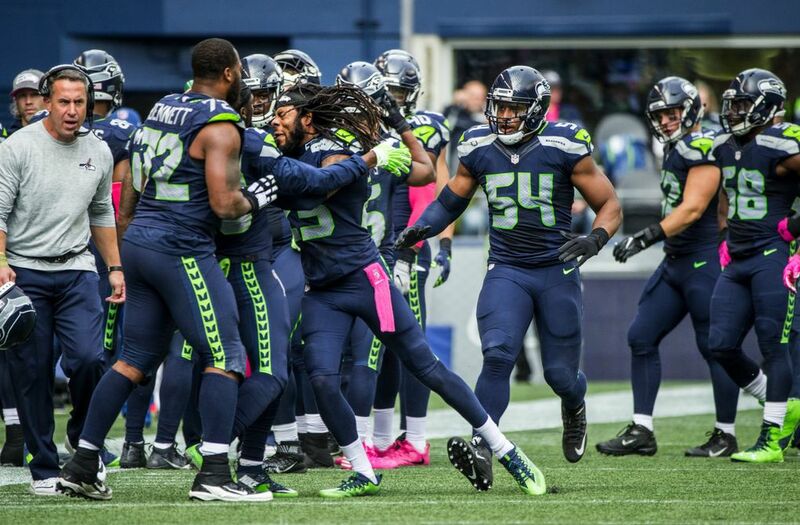 Will Sherman’s public tantrum be a one-day thing or will it linger? Was it a positive or a negative? A harbinger of the future or just an anomaly? The next week could be really fun. • WSU: The Cougars are at the halfway point of the season and that means Jacob Thorpe can stop, look at the results and make a pronouncement. He does all that in this story. ... The volleyball team is in a bit of a slump. ... Arizona State is nursing its wounds after being blown out last week. Elsewhere in the Pac-12, you would have to say WSU has risen from the grave in these conference power rankings. And its projected bowl destination is pretty fun. ... The polls are out and though WSU isn’t ranked, the Cougars did receive votes. ... Washington is back at it this week, hosting Oregon State in a North battle. The Huskies are more than a four-touchdown favorite. ... Oregon and California are coming off byes and will play Friday night. ... Colorado, after dominating ASU, has to deal with a Stanford team coming off a big win at Notre Dame. ... UCLA must regroup and find a way to score against Utah. ... USC and Arizona have byes this week. • Gonzaga: The men’s soccer team fell late against San Francisco. • Whitworth: The women’s soccer team won late against Puget Sound. • Empire: The IFL team added another player to its roster. • Seahawks: John Blanchette was in Pullman on Saturday night and in Seattle on Sunday afternoon. He has a column on Sherman’s outburst and a game story. ... There are more columns from the game, including from Larry Stone, who completed the same double play Blanchette did. ... The injuries, the outburst and the offensive highs and lows are the key pieces of Sunday’s coverage. • Sounders: One win is all the Sounders needed in their final three matches to assure themselves a playoff spot. They still need one after two matches. They led 1-0 Sunday, then gave up two second-half goals and lost 2-1 at Dallas. Now they will face Real Salt Lake next Sunday with a postseason berth on the line. ... Portland stayed in the hunt with a 1-0 win.